The quarter Nordend was already been made available during the Second World War by a bus line. Since 1950 were again regularly travelled on this bus line. On this bus line operated the by the Eberswalde townsfolk "Jumbo" named motor bus. This motor bus was an under use of the car body of the trolleybus no. 1I rebuilt truck. On 05/04/1953 the two-lane new building line Stadtzentrum-Nordend was opened. A regular transport service with trolleybuses could take place only Sundays, since insufficient trolleybuses were available. On other days the traffic was any longer secured through the motor bus "Jumbo" with trailer. 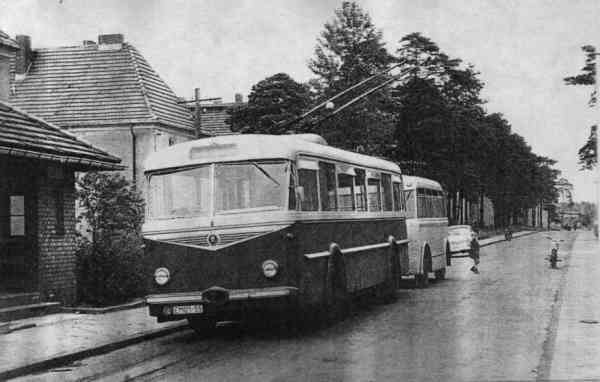 The trolleybus traffic on the line Nordend-Westend will become expanded effective from October 1953 with the initial startup of the trolleybus no. 9II of the GDR type LOWA W 602a and a trailer of the GDR type LOWA W 700 from Sundays on the whole week. The red-white line sign was introduced, which marks until today the line to Nordend. The 3,2 km long trolleybus distance to Nordend branched off at the Friedrich-Ebert-Straße. There the drive-up ramp to the Friedensbrücke itself led at Goethe-Straße at that time, directed the trolleybus distance to Nordend over Goethe-Straße, that at that time newly built Friedensbrücke and then over Straße der Jugend and Poratzstraße to Nordend. Further it went with a single-lane loop from the Poratzstraße through Käthe-Kollwitz-Straße, Helene-Lange-Straße and Rosa-Luxemburg-Straße again to the Poratzstraße. This single-lane loop was 0,7 km long. 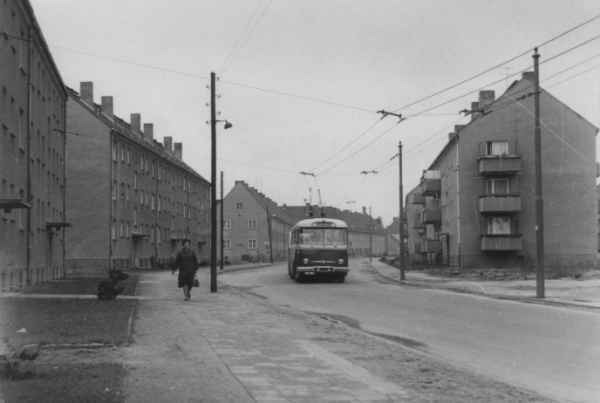 The photo show the structure of the trolley system in Nordend at the crossing Helene-Lange-Straße/Rosa-Luxenburg-Straße. The final stop was located at the Käthe-Kollwitz-Straße. Here a photo of the former final stop Nordend at the Käthe-Kollwitz-Straße. The trolleybus no. 9III of the Czech type ŠKODA 8 Tr6 with trailer of the GDR type W 701 waits for the next use. 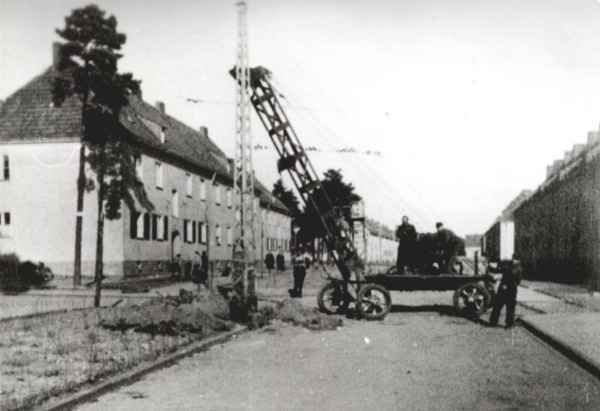 There the Poratzstraße in the lower part led through partially uninhabitated area respectively through area cultivated with one-family houses, both contact lines were fastened to masts with brackets. The photo shows the contact line in the Poratzstraße in height of the junction Akazienweg. The trolleybus no. 18I of the Czech type ŠKODA 9 Tr15 travel the Poratzstraße uphill in direction to the final stop Nordend. In the upper part of the Poratzstraße the contact line was partly to masts, but predominantly fastened to the dwelling houses. 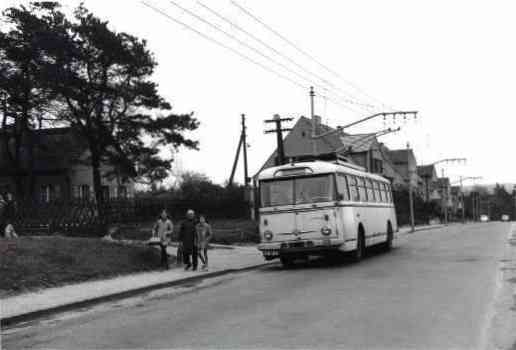 The photo shows a trolleybus of the Czech type ŠKODA 9 Tr at the run in direction to the level crossing Nordend, finally then in direction to Platz der Freundschaft (today: Markt).